Mayani Mamatha was a Telugu movie released under the banner of Bhavani Films produced by Bhamidipati Bapayya Panthulu and was directed by Kamalakara Kameswara Rao. Music was composed by Aswathama, Singers LR Eeswari, Ghantasala, SP Balasubramanyam, Vasantha, P Susheela, Pithapuram shared their vocal contributions for the sound track of this movie. Main cast includes NTR, B Saroja Devi, Sobhan Babu, Nagabhushanam, Lakshmi and many others. Song like Raanika Neekosam sakhi.. is one of the best song in the year of 1970. Mayani Mamatha Mayani Mamatha was a Telugu movie released under the banner of Bhavani Films produced by Bhamidipati Bapayya Panthulu and was directed by Kamalakara Kameswara Rao. Music was composed by Aswathama, Singers LR Eeswari, Ghantasala, SP Balasubramanyam, Vasantha, P Susheela, Pithapuram shared their vocal contributions for the sound track of this movie. Main cast includes NTR, B Saroja Devi, Sobhan Babu, Nagabhushanam, Lakshmi and many others. 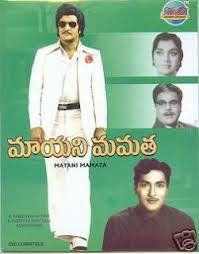 Song like Raanika Neekosam sakhi.. is one of the best song in the year of 1970..